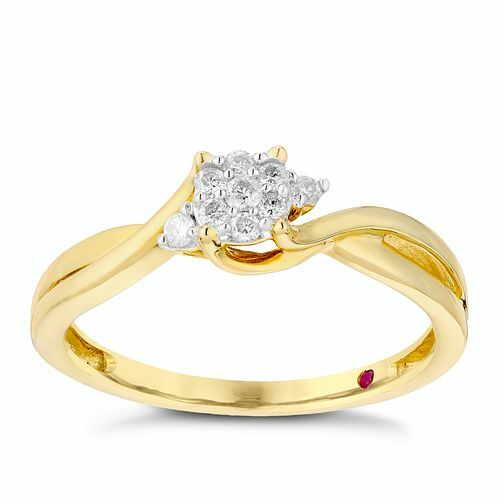 Let them know how special they are with this stunning diamond ring from Cherished. Crafted from luxurious 9ct yellow gold with elegant crossover shoulder detailing, this pretty ring features a round cluster of dazzling diamonds with diamond set shoulder accents. Finished with a secret ruby as a symbol of happiness. Cherished 9ct Yellow Gold Crossover Diamond Cluster Ring is rated 5.0 out of 5 by 1. Rated 5 out of 5 by Anonymous from Very pretty and sparkles lovely. A gorgeous cross over style design. If you want something a bit different style wise this is it. It is a very pretty ring and the diamonds sparkle and the design is lovely. A very pretty stylish diamond ring.